Reindeer Embroider Buddy! Next I am working on the snowman! Not sure why the picture is sideways. I am in love with this mammoth. He is so soft! He was easy to embroidery. I wanted to keep for myself. lol And I made my first bib from scratch with minky material for the back. Was thinking of quilting it but still pondering on that idea. 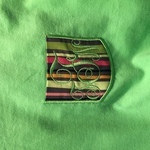 Some shirts with new monograms I got and even made some faux pockets and a raggy pocket as well. Sorry my pictures are sideways for some reason. I even tried embroidering on koozies. Found this cute onsie at Hobby Lobby. My husband's nephew turned 1 in May! I enjoyed doing this for him. His party was sock monkey theme. I made patches for easter baskets for a coworker's grandchildren. Gardening aprons for a friend to give as a gift. Applique embroidery patches for hats. My latest patches I made for hats. I have attached them using the E6000 glue. Just a few things I have made lately. The last picture is a little blurry. But embroidering on burlap was easier than I thought. Getting ready for a craft show and decided to make a few different items. I got this design from urban threads. I wanted to make a pillow and decided to try canvas drop cloth. turned out good. Now to finish cutting the back and finish off with a pillow insert. Kitchen Towels I have embroidered this weekend. I usually get my designs from embroidery library.